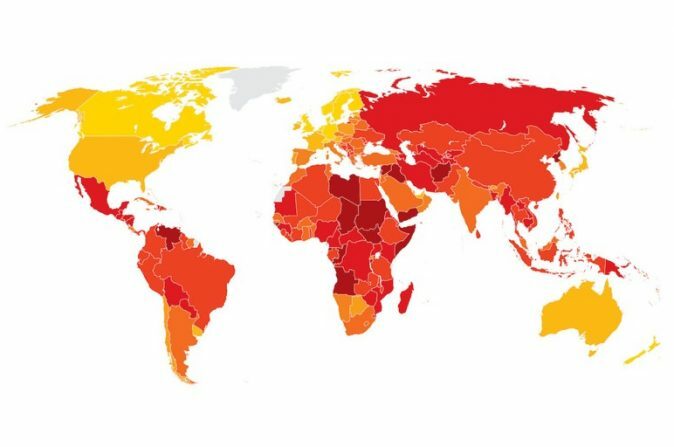 Denmark and New Zealand are the least corrupt countries in the world, according to the 2018 Corruption Perceptions Index released by the anti-corruption campaign group Transparency International. Denmark and New Zealand topped the annual ranking with 88 and 87, respectively, while Somalia, Syria and South Sudan with scores of 10, 13 and 13, respectively, made the bottom of the list. More than two-thirds of countries score below 50 on this year’s CPI, with an average score of just 43, revealing that the continued failure of most countries to significantly control corruption is contributing to a crisis in democracy around the world. In the last seven years, only 20 countries significantly improved their CPI scores, including Estonia, Senegal, Guyana and Côte D’Ivoire, whereas 16 countries significantly decreased their scores, including Australia, Chile, Malta, Hungary and Turkey. According to this year’s CPI, countries with high corruption also have weaker democratic institutions and political rights. There are no democracies that score below 50 on the CPI. Similarly, very few countries which have autocratic characteristics score higher than 50. The report also notes that, according to Freedom House, 113 countries have witnessed a decline in their democracy scores since 2006. Measures recommended by Transparency International towards the prevention of corruption include: strengthening institutions and preserving checks and balances; closing the implementation gap between anti-corruption legislation, practice and enforcement; empowering citizens to speak out and hold governments accountable; and protecting press freedoms so no journalist has to fear for their lives when reporting on corruption.